Public classes are held at various locations in Massachusetts including: Braintree, Kingston, Duxbury, Westwood, Quincy and Hyannis. Classes include BLS – Basic Life Support Provider, Pediatric CPR AED First Aid, Heartsaver First Aid, and Heartsaver CPR AED. Recertification classes also available. Space is limited for our public classes and pre-registration is required. If you are under 18 and attending without a parent or guardian, you will need to submit a permission form in order to attend our classes. The form can be found under class registration forms. Infant, child, and adult techniques for choking and CPR (for 1 and 2 rescuers), AED (defibrillator) training, and use of barrier devices taught. Includes written exam. American Heart Association certificates issued. Heartsaver CPR AED Adult/ Pediatric is designed for non-medical workers, child care providers, and members of the general public. Includes adult/ child/ infant techniques for choking, CPR and AED (automatic external defibrillator). American Heart Association certificates issued. How to recognize and treat common emergencies, such as burns, bleeding, shock, poisoning, stroke, electrical shock, and broken bones. Written exam. American Heart Association certification cards issued. 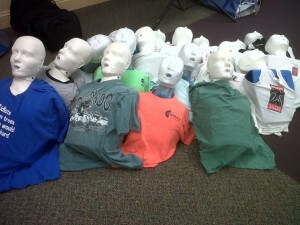 Includes modules on both Pediatric First Aid and Adult/Pediatric CPR AED. American Heart Association certification cards issued.